We usually only notice technology the most when it isn’t working. That’s especially true with hearing aids: Hearing aids are a vital lifeline to the rest of the world for people who wear them not just a piece of technology. So discovering solutions for a malfunctioning hearing aid, and discovering those solutions as quickly as possible, is vital for both physiological and emotional reasons. Troubleshooting can be a difficult, risky process whether you’ve been using them for a week, a year, or decades. But there are some relatively easy strategies you can try to get your hearing aid working correctly again. Any advanced piece of technology requires maintenance, and hearing aids are no different. Although the casing might look simple and robust, the electronics inside can be amazingly sophisticated. Which means upkeep is essential. As you’re using your hearing aids, there are some things you can do that will make taking care of them easier. Your ears normally and naturally produce a certain amount of wax each day. And, to a certain extent, that earwax is helpful for your ears. But it’s not so great for your hearing aids. To help improve the life of your device keep your hearing aids clean and clear of wax. The fact is that a built-in wax filter comes standard with most hearing aids that should also be cleaned periodically. Electronics and moisture don’t mix. And in spite of the best protection technology can produce, repeated subjection to moisture can eventually wear down the internal electronics of your hearing aids, reducing their performance. This means that you shouldn’t use your hearing aids in the shower or while in the pool. Additionally, if your hearing aids do become wet, towel-dry them; heat from a hairdryer, as an example, can damage your hearing aids. Hearing aids require specialized cleaning as they are delicate, expensive technology. Even if you’re pretty thorough about your own cleaning habits, there are just some things that can be better accomplished by a specialized cleaner. Protective steps are essential if your hearing aids are currently working correctly. But if you’re having problems, if your hearing aids aren’t working properly anymore, you’re most likely more interested in some quick fixes. Switch between programs or adjust the settings. How you respond will depend on the model because each one is different in this regard. Adjust the volume. Sometimes you can do this via a remote or manually with the dial on the hearing aid. Try to do both if you have both features with your hearing aid. Look inside the battery compartment. Look for corrosion or loose wiring. Any extensive damage will have to be fixed by a professional but you can try cleaning off any corrosion you find. Turn your hearing aid of then back on. This will fix the issue in some cases. Check your own ears. It’s possible that earwax buildup in your ear canal is interfering with the sound from your hearing aid. Check your hearing aid for debris or wax build up. Carefully wipe away any wax or debris you may discover. Examine your hearing aids for blemishes, cracks or other noticeable signs of damage. Your hearing aid might need to be repaired if you notice any of this kind of damage. Even if your batteries are rechargeable they will occasionally need to be replaced. It’s likely that you will need to have the device fixed professionally if you want it back to original performance if none of these options work. 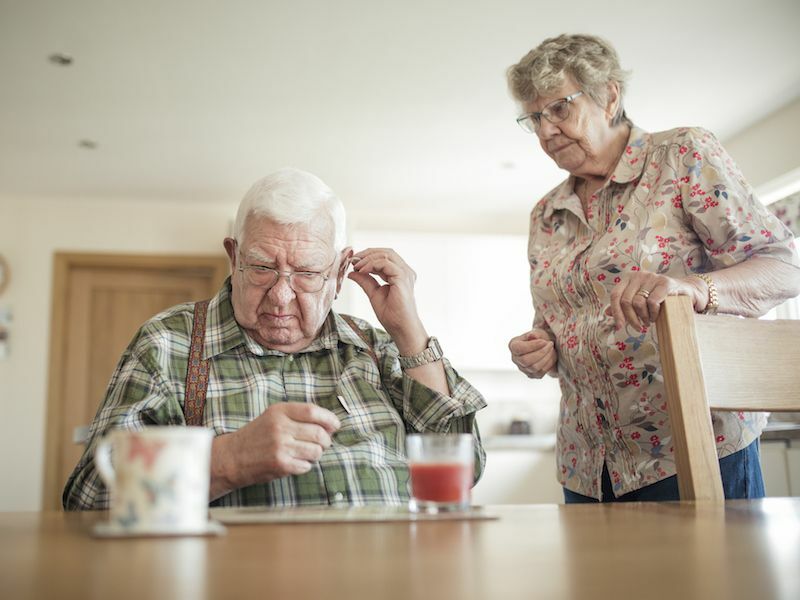 You will likely have two choices if you’ve tried to troubleshoot your hearing aid and it still won’t work: either send the hearing aids in for service or purchase a new set of hearing aids. Which choice works best for you will depend on your circumstances, the age of your hearing aids, and other variables. Take the time to troubleshoot your hearing aids if they aren’t working properly. If that doesn’t work, you can move on to the next steps, including a discussion with a hearing specialist to find a solution. To find a solution make your appointment right away.